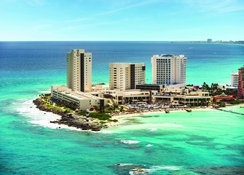 Hyatt Ziva Cancun is a family-friendly all-inclusive resort by the beach of Punta Cancun in Youcatan peninsular. Blessed with a gorgeous location surrounded by fine white sand beaches, and clear-blue waters of the Caribbean Sea, guests can relax in luxurious guestrooms and suites with balconies and enjoy breath-taking ocean views. 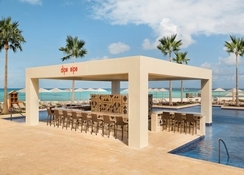 The resort has several specialty restaurants serving up flavours from around the world, bars that conjure up exotic tropical cocktails and pools to lounge in all day doing virtually nothing. 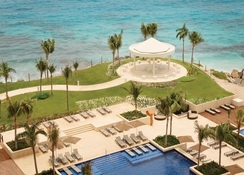 Immerse in pure luxury at this blissful retreat or plan a playful family beach escape in sunny Cancun. 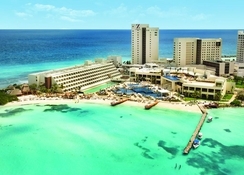 Hyatt Ziva Cancun is a family-friendly all-inclusive resort by the beach of Punta Cancun in Yucatan peninsula. The resort is located 1.4km from the Coco Bongo nightclub and 4km from the La Isla Shopping Mall. 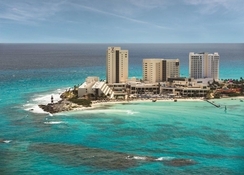 The Cancun International Airport is 23.1km from the property. 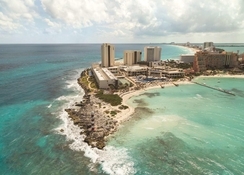 Designed with Mayan inspired architecture, Hyatt Ziva Cancun resembles a village-like atmosphere with a feel of the incredible natural beauty of Mexico's coast. Featuring 547 luxury suites decorated with contemporary Caribbean influence, handmade furnishings and lovely views of the Caribbean Sea, the rooms come with spa-like bathrooms with rainfall showers, flat-screen TV, mini bar, coffee maker, high-tech entertainment, turndown service and complimentary refreshment—soft drinks, premium beers and liquors. There are lovely furnished balconies offering wonderful views of the sea, swaying palms and lagoons and infinity pools. Hyatt Ziva Cancun has eight unique restaurants and three lounges offering a wide array of international and local cuisine. While Le Bastille is for French, El Mercado is for international, The Moongate for Asian, Habaneros for Seafood, Lorenzo’s for Italian and Chevy’s for American. There are also six bars on the property, including a microbrewery where you can enjoy beers, spirits and wines! 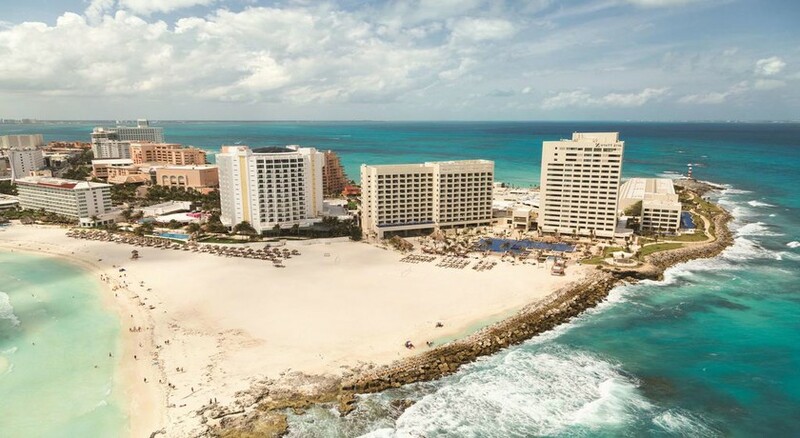 Hyatt Ziva Cancun offers several options to unwind for the entire family—relax in a beachside cabana, taste a margarita and enjoy water sports such as diving, swimming, or cruise in the Caribbean Sea. Guests can bathe in the sun at the three fine Infinity pools overlooking the ocean, while sipping on delicious cocktails made at the pool side bar. You can also visit the spa for a rejuvenating body massage or enjoy a back rub along with other body treatments. Flanked on three sides by the bluest ocean and whitest sand, all you need to worry about is the perfect place to lay your beach towel.